I am back at work after a couple of days’ leave attending a Church Camp. I was in Court this morning and will have to be back there again after lunch, so I’ll have to put up a quickie post. Whilst I have one new recipe to share, I don’t have enough time to get it up today. So, I’ll take you on a journey to Segambut, Kuala Lumpur for an excellent fried chicken rice. No, the rice is not fried. The chicken is. This is again, a review which I previously did in my personal blog and I hope you’ll start drooling when you read on. Get your tissues ready! 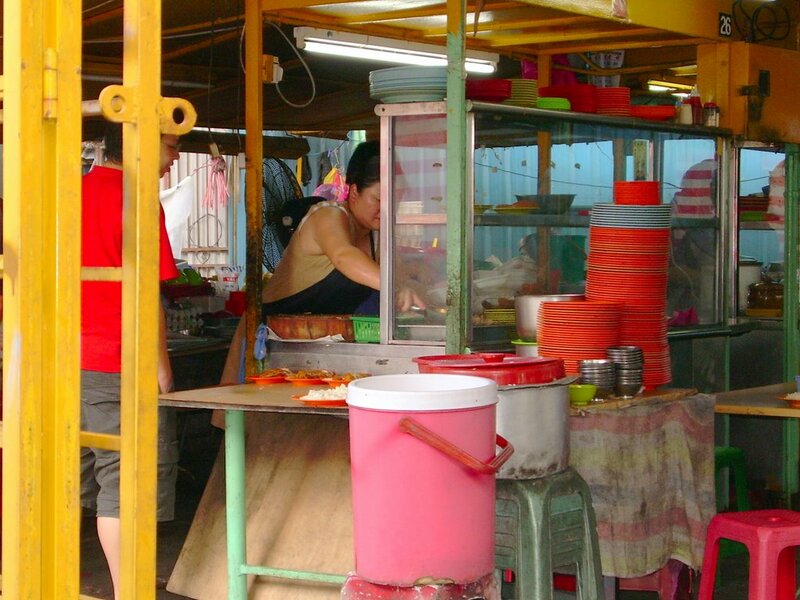 What can be so interesting about some Fried Chicken Rice that is drawing the crowds? How can the business be so good that the proprietor can afford to only sell the Fried Chicken Rice on Mondays, Wednesdays and Saturdays? Have a look at the crowd and taste the fried chicken for all your questions answered. Take a drive to the Segambut roundabout and head towards the direction of Total Office and GBH on your left. You will see a traffic light in front of you. 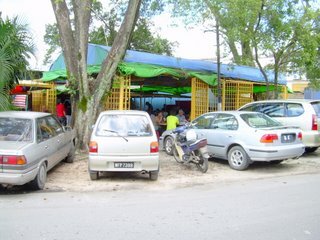 Take a right turn and you shall see a well-known restaurant on your left called Yu Ai (which sells the famous Segambut Tom Yam Noodles). Take a right turn into Persiaran Segambut Tengah 1. This Fried Chicken Rice stall is upon the first right hand turn. If you are lost, just ask any of the people in the vicinity. I did not name the stall because the stall has no name. When I asked the proprietor about it, he just mentioned “Under the Big Tree”. Thank you very much! That was very helpful. Anyway, where good food is concerned, the name is not important. Foodlovers will find you in any event. 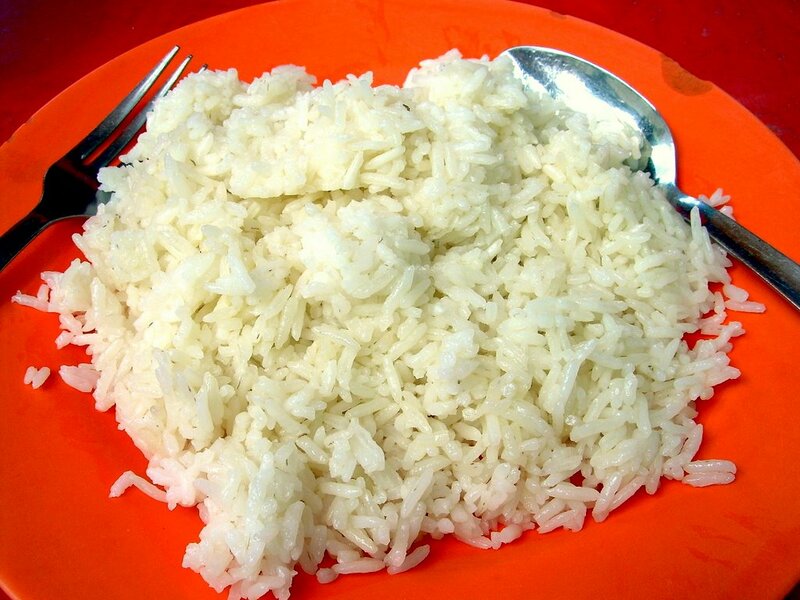 So, we (3 of us) had a plate of rice each. 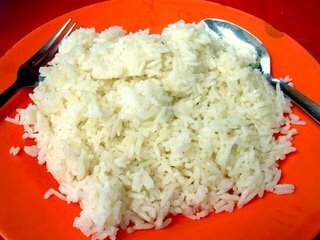 The rice, which is very fragrant and fluffy, was probably cooked in chicken stock with plenty of garlic, shallots and pandan leaves. Borrowing what Gardenia said “You can even eat it on its own!”. Quite a generous portion is given but don’t worry. You will finish it in no time. The highlight here is of course, the Fried Chicken which has made this stall so famous in the Klang Valley and now, worldwide thanks to the Internet. The Fried Chicken is very crispy on the outside. I would call it fried to perfection and would love to learn that skill one day. It must have to do with the skill of the person frying the chicken to have the skin fried till crisp (but not oily) whilst the meat is thoroughly cooked and retaining its tenderness and juice. The marinade is a closely guarded secret which renders the chicken really tasty. Most tables we see have extra servings of rice and chicken which is a testimony of how good it really is. The chilli sauce has a generous amount of garlic and compliments the Fried Chicken Rice really well. Unfortunately, the picture did not turn out well as I was getting impatient to sink my teeth into the rice whilst clicking away. The Fried Chicken Rice is sold at RM3.20 for drumstick / thigh with rice. For a whole leg (drumstick + thigh), that will cost RM5.00. Not overly expensive considering that the chicken portion is quite big (unlike KFC). Give it a try. Do remember that it is only sold on Mondays, Wednesdays and Saturdays from 10.30am till after lunch. Be early to get a seat or drool while you stand and wait for your turn. Only on Mon Wed & Sat. Only on Mon Wed & Sat. 136, 136. Must remember. Must… stop… drooling… otherwise my colleagues will think I’m looking at questionable content. First time I ever seen fried chicken served with chicken rice, but Segamat is oh so far away. Oh this is so my thing. Hmmm…if I leave my office at 12:15pm, I probably can reach there at 12:45pm. Do you think it would be too late? I want to try it so badly!! Agreed. Great yummy chicken. And at affordable prices. The place is a tad dirty though. 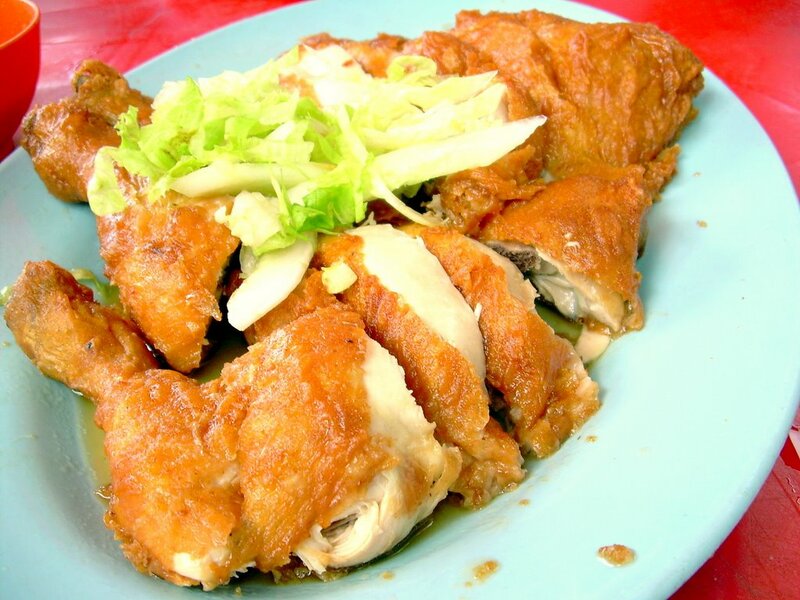 There is the exact same style of Fried Chicken Rice in Paramount near SS2! Even your description of the rice cooked in stock with lots of garlic. Did your “Under the Big Tree” stall in Segambut move to Paramount by any chance? Did your meal come with beansprouts on a seperate dish for the vegetables dish?